I joined the October Pink by making a pink bento theme. Some of my bento friends like Chantale, Debra, Susan Yuen, Emily have posted their pink bento on their blog too. I believe many more will join to post their pink bento theme soon. One of my Aunties suffered from breast cancer and lost the battle a few years ago. I still remembered how devastated my uncle and my cousins were. Hope the Pink Ribbon will alert us about breast cancer awareness and to give support to anyone who has been affected by breast cancer. I made pink bear from rice, kamaboko, crab stick, and nori. The pink ribbon was made of colored egg sheet. Inside the other box : tamagoyaki, grape tomatoes, flower shapes fish sausages, bean sprout & celery stir fry with ebi (dried shrimp), and chicken paprika stir fry. Please join the Pink October event organized by Bento Blog. For more details , you can read here. If you are on Twitter, please add #ThinkPink and #ProjectPink when you tweet about your pink bento. For more information about breast cancer, please check out Susan G. Komen site. what a sweet caring bear..
As usual, your work is beautiful. Hm...the closing for this #thinkpink and #projectpink will be on tomorrow 12th Oct? so cute :) How did you make your rice pink? I love the bear. You made a cute cute meal! What a beautiful bear! This is a wonderful Breast Cancer Awareness bento! @JDaniel4's Mom : Thanks a lot for your kind comment! So cute pink bear ^_^, would be so nice to have that ume powder here too :P.
A sweet obento for a noble cause, ♥. That is the sweetest, prettiest most awesome pink heart Care Bear ever created! I just love it! Thanks so much for getting involved Lia. I knew the bento community would jump in.. you are all such generous, warm hearted and supportive community out there. Cute Care bear ^^ I can't decide if I want to hug or eat it. Love the pink bear ... and the ribbon too ... and everything ... love it love it love it. @sherimiya : Thanks a lot Sheri for your sweet comment! Sweet and delicate bento with your uniquely beautiful details Lia, sigh! @Flicksi : hehehe ... Thanks a lot! Lia, that is so good! The pink bear looks like a fuzzy stuffed bear! I think it's wonderful what you all are doing for this great cause! Sweet "Care Bear!" Clever to use a tender icon like this for breast cancer awareness. So cute. such a comforting and cute pink teddy, with so many pretty little details! you always take it to the next level with your neat and precise execution lia! sorry to hear about your aunty, i lost a dear aunt too. hopefully women of our generation (and audrey's) will be better aware and do early mammograms etc.! Aw, the bear is *too cute*! I'll probably squash it giving a bear hug, right? 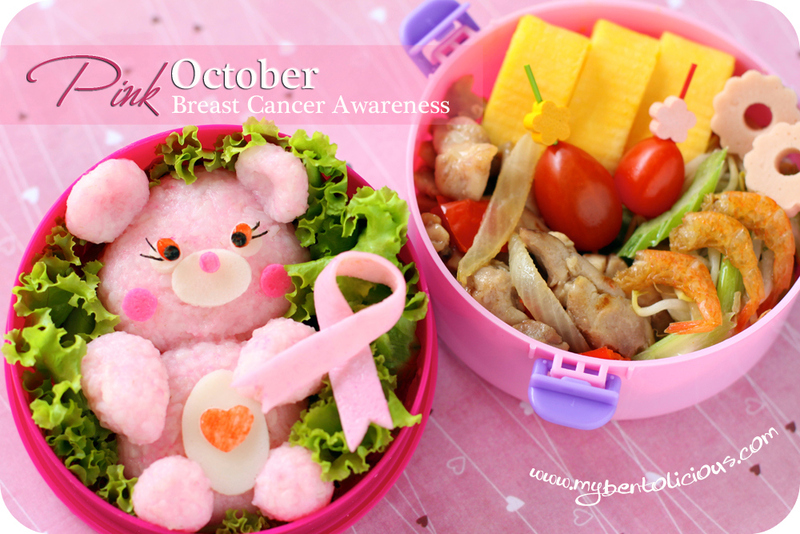 Awesome Pink Ribbon Bento! @gnoegnoe : hehehe ... You can do anything. Thanks a lot Gnoe! @ktia : Thanks a lot for your kind comment! I got two aunts who suffered from breast cancer too, one decease while the other got it removed and back to pink of health. I strongly support pink ribbon awareness. So Ladies, let's get pink! @NoveiMC : Thanks a lot for your kind comment! Love your blog too ♥ Great bento! @Rio : Oh no! So sorry to hear about your sister. I will be honor to dedicate this bento to her. Thanks a lot Rio!